Liz Lothrop Update: Clearly Sarge is stopping shy of nothing to bust out the Orange in support of Liz!!! 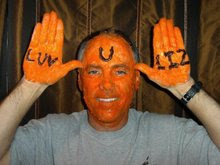 Clearly Sarge is stopping shy of nothing to bust out the Orange in support of Liz!!! Its amazing to see the amount of people who wear orange on tuesday, even if they have never even met you! Everyone is praying for you so much! We know you are such a strong and positive person! Stay strong Liz! What a joy to be back in town and with you yesterday, Liz! You light up the hospital room. Could it be the light of Jesus shining through you? Keep the faith! My Gracie says 'Hi' and she hopes to see you soon. Wow! look at what people will do for you color themselves in orange pretty cool..see how many lives you have touched.. now everyone is showing you how you have SHINED in their liVES..you are loved my friend very much!! Hope you are feeling good today..stay strong..